Would you take Bendtner back? 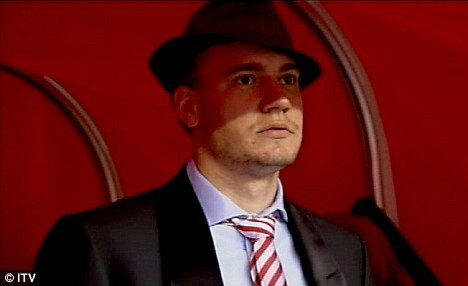 Nicklas took wearing ridiculous hats a step too far. Apologies for the lateness of today’s entry. Ordinarily, I strive to have my witless chuntering up and available for reading before the stroke of 9am. This morning, thanks in no small measure to a late night, I’ve overslept slightly and it’s all one big rush to get thing done. I thought, seeing as there’s little in the way of news. I’d start up a discussion about our Danish striker. When he was sent out on loan to Sunderland, I did exactly shed a tear. His tenure as an Arsenal play is essentially a litany of calamitous misses and countless examples of that bone-idle swagger of his. He has an ego that defies belief, and upsetting others members of the team seems to be his real talent – I recall hearing a story about how his insistence on wearing one of his ridiculous hats in the dressing room upset Jens Lehmann last season. But he could show the occasional moment of brilliance – Ipswich in the Carling Cup semi-final – and his goal return is still miles better than our current 2nd and 3rd choice strikers. For all his flaws, he does, buried deep down somewhere, have the makings of a good centre forward. A lot of the time during his final season at the club, he was deployed out of position on the right wing where he was ineffective. I regard that as one of Wenger’s more baffling decisions. If we secure the services of one of Podolski or Giroud, then I’m fairly sure he’ll be staying at Sunderland or packing his bags for somewhere else. But that said, he does make for a better option than either Chamakh or Park. Would you take him back? Do you think his days of battering parked cars with Lee Cattermole and being an all-round prat are behind him, and he could be affective if we have injuries? Or will you put his time at Arsenal alongside the likes of David Bentley and write him off as another egomaniac without the skills to back up what comes out of his mouth? QPR reaction, M’Vila and stuff. Chamakh won’t leave, Wilshere to play ‘behind closed doors’ friendly, the Podolski medical and Yaan M’Vila: should we or shouldn’t we? The world’s best player needs to play for the best team in the world. I don’t think we are the best atm. I think the more pertinent question is whether Nicklas wants to come back. We may consider a good 3rd choice striker, but he certainly doesn’t see himself as that. Unless he gets some guarantees of playing time, I suspect he will try to engineer a move away. Personally, I would keep the door open to his return, but I just don’t see it happening. He’ll only be required for the height he’s got. The headers that he can provide. Don’t think Podolski or RvP can fill that gap. Even Vela can’t. Neither Park. Only Chamakh can. But, will he? i think he should be back.knows premier league btr thn podolski.he is on fire for sunderland. It’s a travesty in his own mind that he hasn’t yet won the Ballon d’Ore! Nicklas would have been a better back-up this season but insisted that he go out on loan … “on fire at Sunderland” he is not. He won’t get a permanent deal there so expect either another loan out or if he is lucky a call from a mid-table German outfit! We won’t need and I for one don’t want him next season. The liking to Bentley is all too true and look where he has finally landed – The Tiny Totts of Totteringham with two more unsuccessful loans to his name. One of the most positive outcomes for me this season is the closeness of the squad in the dressing-room. This has been a long time in the making since the departure of Toure and Ade-cant-stay-anywhere-any-more through Gallas to Nasri last season. The ego of 10 on a scale of 1-9 ( http://www.mirrorfootball.co.uk/news/Nicklas-Bendtner-has-stunned-Arsenal-s-sports-psychologist-with-the-highest-self-confidence-rating-ever-recorded-article690591.html ) was the final disruptive to be shipped out. Afobe is the long term future from the youth and he has a really positive but not egotistical nature. Podolski plus one other such as Luuk de Jong and I think we are pretty set for the next 3 years or so!